On the recently completed National September 11 Memorial and Museum. I arrived at the National September 11 Memorial and Museum with frankly low expectations. Like all of the civilized world, I have little affection for the date the museum commemorates and the site it now occupies. It need not be said that the murder of nearly 3,000 innocent people by jihadist terrorists, broadcast to a reported 2 billion viewers worldwide, defined my generation’s darkest day. Even as I watched the ruins of the Trade Center cleared away and new buildings rise, the memory continued to drive me, physically and emotionally, from the site of the attacks. It hasn’t helped that the subsequent renewal of these blocks of downtown Manhattan has turned tragedy into farce. Caught in a mire of city and state agencies, redevelopment rights, insurance claims, and the supra-governmental ownership of the Port Authority of New York and New Jersey, not to mention the divergent wishes of the families directly affected by the attacks, Ground Zero ground to a halt for years after 2001. Thirteen years on, the area largely remains a construction zone, imprisoned by barbed wire, guarded by a militarized police force, with a folly of new buildings encircling the federally protected footprints of the former Twin Towers. On one side, punctuated by the sound of acetylene torches, is the overbuilt and overpriced skeleton of Santiago Calatrava’s future rail station, now resembling the flayed carcass of an armadillo. On another is One World Trade Center, the skyscraper formerly known as the Freedom Tower. Saved and crystallized by the architect David Childs from the ambulance-chasing Daniel Libeskind, this monumental headstone was ultimately shortchanged through a scandalous deal between the Port Authority and the Durst Organization, which eliminated the sculptural radome from the building’s forty-story spire and squared off its chamfered base. And at the center is the Memorial itself, a set of inverse fountains by Michael Arad called Reflecting Absence. In concept, they looked to me like an endless replay of the cascading curtain walls of the collapsing towers. Then there’s the question of how to memorialize brazen acts of terror. The asymmetrical nature of terrorist strategy relies on the spectacle of destruction to make up for deficiencies in force. Most often terrorism turns the peaceful tools of its adversaries into weapons against them: the liberalizing good of commercial air travel; the freedom of the press. Modern terrorism would largely cease to terrorize without the assistance of our broadcast media. One reason why the attacks of 9/11 were so terrifying was that their coordination meant they were captured and broadcast worldwide in real time. Wouldn’t a museum of crushed relics and looped videotape simply further the terrorizing spectacle, putting the trophies of the attackers on permanent display? And finally there’s the issue of whether any contemporary museum can suitably address a solemn topic on sacred ground. Our cultural establishment has long made a priority out of desacralizing civic institutions. Museumgoers have long been encouraged to check their reverence at the door. No surprise that early reports of the Museum have mostly swirled around the conflicts between the hallowed expectations of the victims’ families and the profane business of what would otherwise be standard museum practice: cocktail fundraisers, photo opportunities, and merchandise sales through a gift shop, all taking place on the site of a mass grave. Yet, somehow despite all these challenges, I found the 9/11 Memorial and Museum to be profoundly moving, a complex distilled of its own complexity, with the calming grace of renewal emerging from the center of destruction. The fountains themselves went through several changes, as the landscape architect Peter Walker and then-mayor Michael Bloomberg reportedly reined in some of the expense of Arad’s more elaborate proposal. The Memorial, which opened to the public over the tenth anniversary of the attacks, reveals that sometimes design by committee actually works. 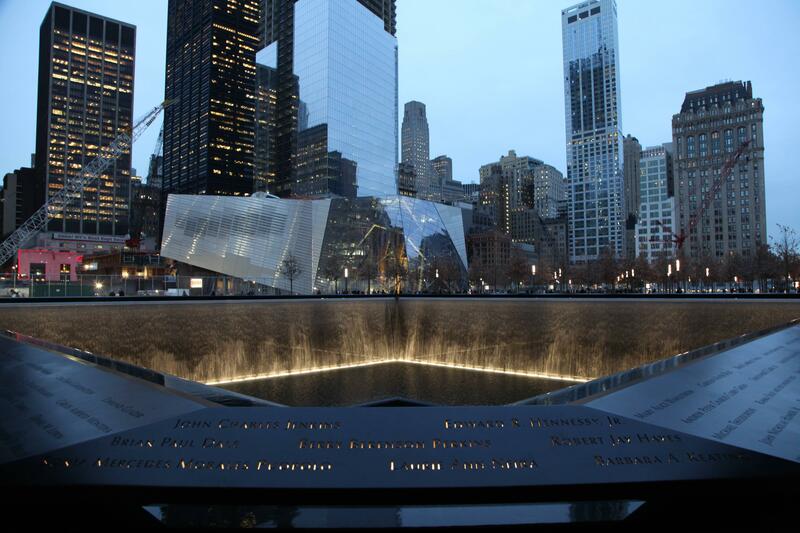 The fountains are the first features you encounter when visiting the site and, along with the Museum, are administered by the 9/11 Memorial Foundation. They also set the theme for the overall memorial complex: a structure in reverse, an anti-monument of negative space, introverted and underground, affecting in its strangeness. The fountains are deeper and larger than I imagined. Far from destabilizing, they are wells of contemplation. By overlaying the footprints of the original towers, they restore the first sense of rectilinear order that the terrorists tried to erase. In a smart departure from Arad’s original design, which imagined a subterranean passage behind the falls, the names of the deceased are now etched at plaza level in a slanted table ringing each fountain. Accessible, touchable, and returned to daylight, they have been arranged through a painstaking algorithm of affinities that further restores the individualism of the dead. The names of all the victims of the four-pronged 9/11 attacks are included, including those who lost their lives at the Pentagon and on the field in Pennsylvania, as well as the six individuals who were killed in the 1993 World Trade Center bombing. Through the sound of the water and the mist of the falls, the fountains distinguish a separate, unenterable space set apart from the noise of the city. They are also technical and aesthetic marvels: The falling water is more orderly and channeled than I first had feared. The pattern of ripples in the basin is mesmerizing, acting less like a reflecting mirror and more like an ethereal portal. And the water laps into a second square void at the center of each fountain with a bottom that is below our line of sight, creating an infinite recession. After an initial descent from daylight, the Museum darkens to a receiving floor. On the way down, the escalators pass beneath a trident-shaped piece of the salvaged Trade Center facade, part of the Museum’s gradual introduction of artifacts. A ramp then zigzags deep down to the base of the site. In different hands, this could have been “9/11: The Ride,” but here the Museum has gone a different way, opting for spareness and quiet, with a few key objects, like the Last Column removed from the rubble, rising from the bedrock into the subterranean space of the Museum and visible at points on the walkway down. After a final descent by escalator, positioned beside the rubble of the Survivors’ Stairs, the Museum reaches bedrock. Designed by the architecture firm Davis Brody Bond, the space here divides between the open void of the overall underground chamber and a tighter area directly beneath the two fountains—the locations of the former Twin Towers. Encouraged by victims’ groups, the Museum has left the square box foundations of the towers’ curtain wall visible in the concrete floor. Under the stewardship of Alice M. Greenwald, the Museum has wisely divided its layout into distinct precincts, with different feels. The open space called Foundation Hall, outside the ring of the towers, bounded by slurry walls, looks at life outside of the fateful day. Here are items that speak to the heroism of the recovery efforts and the outpouring of worldwide emotion, such as memorial quilts and the Dream Bike restored in honor of the fallen FDNY firefighter Gerard “Biscuits” Baptiste. Here also is a handful of the largest relics of the destruction: a crushed fire truck, a section of the north tower’s radio mast, other pieces of twisted steel. While at first seeming to aestheticize the attacks, like crumbled sculptures by John Chamberlain, these spare items take on a spiritual transference, especially as one notable relic came to resemble a cross, and recovery workers carved another into religious symbols. Not everything worked for me: A large commissioned wall piece by Spencer Finch called Trying to Remember the Color of the Sky on That September Morning, meant to honor the thousands of unidentified remains behind it, merely managed to bring minimalist kitsch below grade. A section here is also devoted to the history of the towers themselves: the innovation and exhibitionism that went into their construction and the controversies surrounding their design. As the excavations descend to schist, there is comfort in reaching the stability of lowest ground, of seeing sparkling rock. It is reassuring how the Museum looks to tell so many chapters of a long story, with many narrators and varieties of tone, rather than just the one the attackers set out to broadcast. As a final separation, the Museum divides out the story of the attacks and an exhibition honoring the victims between the two tower footprints. Each is set off by its own entry-point, and guards remind visitors that cameras are not permitted in either space. In one instance, I found the loud admonition more jarring than the offense, although the policy is appropriate, and it sets the tone for these tight inner sanctums. Both of these spaces are affecting, in profoundly different ways. 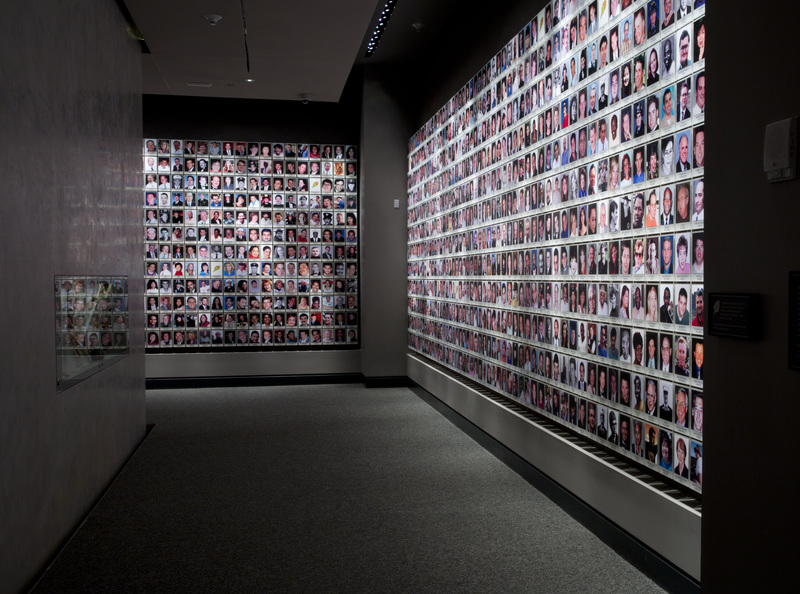 The Memorial Exhibition is spare, small, and solemn, more like a chapel, with simple photographs of each of the victims and an inner projection room that profiles each of them. Although made nowhere apparent in the museum, the reason more of this tower’s footprint is inaccessible is that much of it is still taken up by the commuter rail PATH tracks. As in the original tower design, trains cut through the lowest level of the site—a reminder of the conflicting demands on this real estate. Telling the story of 9/11 is a minefield. 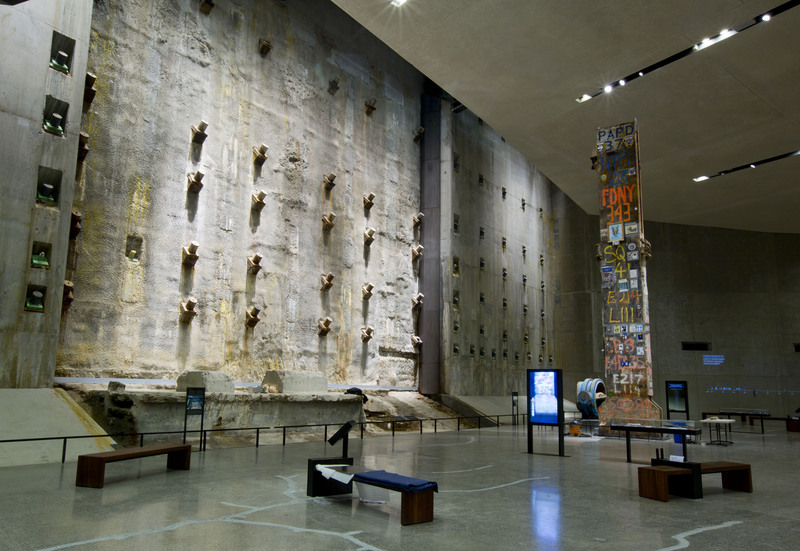 Yet it must be told, and the 9/11 Museum does it better than anyone might expect. Although named after 9/11, the Museum uses its spaces not to broadcast but to encapsulate the spectacle of the terrorizing day. The Museum is “As much about ‘9/12’ as it is about 9/11,” Greenwald explains in an introductory message. While neutralizing the specter of mass murder, the 9/11 Museum leaves little doubt of the fascist virus behind the attacks. It also helps replace swirling memory with a new foundation. It preserves an intimate story of our soldier citizens for the growing ranks of those who did not experience it firsthand, in particular the foreign and the young. Contrary to some reports, almost every visitor I saw behaved with dignity. There is comfort in bearing witness together as we ensure that We Will Never Forget.